Want to chill on a budget? 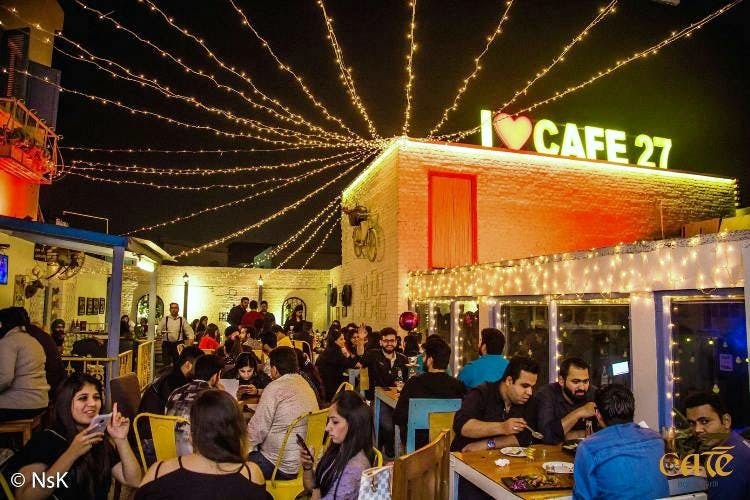 Head to Café 27 that has a cool terrace and an indoor café for anyone who wants to socialise or is looking at spending some alone time. Cocktails, live music and budget dining. A date with bae, squad or yourself? Cafe 27 makes the cut for everyone. The café has a warm, cosy set-up with lots of green space. The lighting in the evening lends it a very romantic vibe and alcohol helps keep conversations easy breezy. We were told about their bestselling House Wine Domestic Sangria and Cheesy Nachos and they lived up to the reviews for sure. And the good old classic sangria with finely chopped apples and orange pieces was a winner. Bollywood and sufi music kept us in good spirits as the sangria kept flowing and in all, we enjoyed the evening. A flurry of overenthusiastic serve staff can be a bit intrusive at times. If you want to have an intimate chat session with light nibbles, look for a place on the terrace.